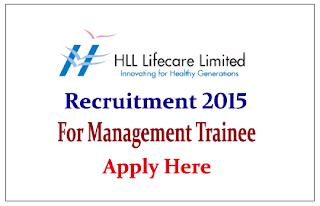 HLL Lifecare recruiting for the post of Management Trainee (Engineering, Marketing, HR, and Pharma) Interested and Eligible candidate can apply on or before 08th July 2015. Company Profile: HLL Lifecare Limited (HLL), a Central Public Sector Enterprise, is a multi-product, multi-service, multi-location and value-driven organisation with a global presence. It produces health care products, including condoms, Surgical Sutures, Hydrocephalus Shunts, Tissue Expanders, blood bags, and contraceptive pills. HLL is touching the lives of millions across the globe, bringing happiness along the way. 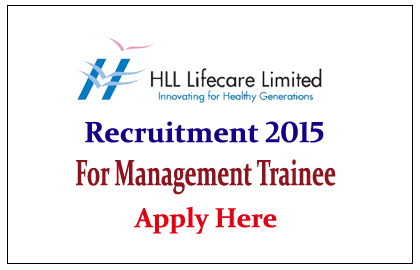 How to Apply: Interested and eligible candidate can apply online on or before 08.07.2015. For more details kindly check official notification.